My good friend Jess (check out her blog here!) got me an awesome Pampered Chef brownie pan for my birthday. I was super excited to make granola bars in it, because the ones I make usually end up looking like cookies rather than bars. Also, the last time I made them, I baked them on the wrong side of the wax paper (who knew there were two sides?) and they all stuck to it and it was a giant fail. So now that I have the pan, they came out in perfect squares and did not stick – win! I have also tried making these with peanut butter chips and peanut butter (omitting the coconut and using less oil), so you can make these in any variation you like. Enjoy and let me know how they turn out! Preheat oven to 350 F and spray a brownie pan with coconut nonstick cooking spray. 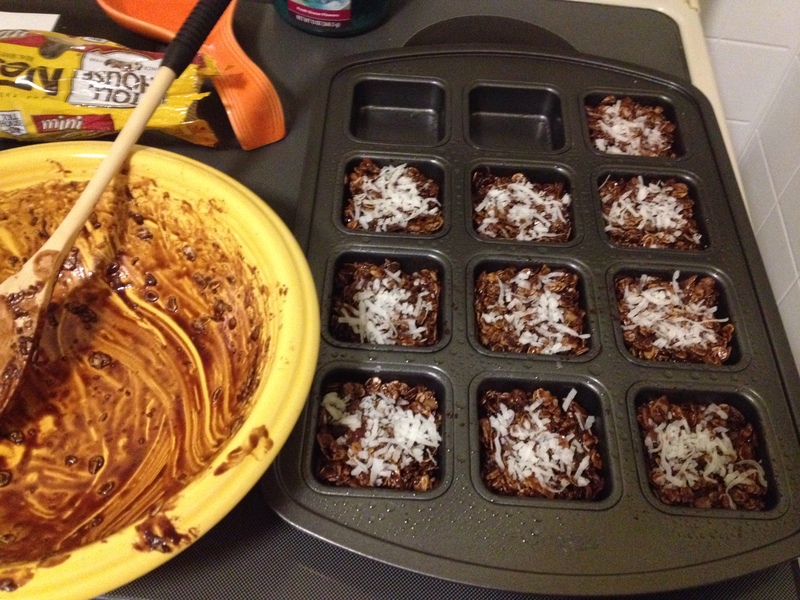 In a medium size bowl, mix together oats, coconut flakes, and cocoa powder. Then, add the rest of the ingredients and mix with a wooden spoon until thoroughly mixed. To form bars, wet hands and scoop a palm sized amount of dough. Press into each brownie well, making sure to press them very firmly (they will keep their bar shape better this way). You may need to keep wetting your hands so the dough doesn’t stick to your hands. Your hands will get messy! For garnish, add more coconut flakes (press into bars). Bake at 350 for about 12 minutes, just enough to turn the coconut flakes golden brown. Wait until cooled to remove them from the pan with a plastic spoon/spatula (I put the whole pan in the freezer for a bit). These look awesome – I’m gonna try making them (gotta love Fit Foodie Lee)! So glad you like the brownie pan. It’s the best thing PC has!